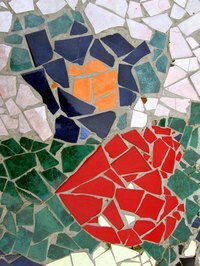 Broken tiles and damaged plates find new life as the colorful components of mosaics. The hard, durable surface of mosaics make a colorful and practical decoration for a table you can use on your patio, in the garden, or by the pool. Scour tag sales, flea market and hardware store sale bins for material to create your mosaics. Even ugly tile or china provides the raw material for a beautiful mosaic design you'll enjoy on your outdoor table for years to come. Wrap your tiles or plates in the old blanket or sheet. Put on the gloves and safety glasses. Use the hammer to break the tiles into small pieces. Sketch your design on the plywood with the pencil. You can choose a central design with the main motif at the center of the table, or divide the table into sections with a different design in each section. Sort the pieces of tile or china by color to make them easier to place in your design. Paint a thin coat of tile cement or mastic onto a six-inch square section of the design. Start in the middle of the board and plan to work out. Fill in this portion of the design with the pieces of tile or china. Place the pieces close together, but they don't have to touch. Paint the tile cement or mastic on the next section of the plywood and fill in with tile. Repeat this, one section at a time, until the entire board is covered. Allow the mastic to dry several hours or overnight. Cover the top of the table with grout. Use a stiff brush to work the grout into the spaces between tiles. Wet the sponge and use it to wipe away the grout from the top of the tiles. Continue wetting and wiping the tiles until the design is clean. Allow the grout to dry overnight. Cover the table top with a coat of sealant to protect the top from rain and weather. Instead of tiles of broken china, use flat glass marbles designed for making flower arrangements. Place your finished table top on an old wooden spool or existing patio table. You can also use this technique to cover coffee tables, end tables, night stands and other flat surfaces. Wear gloves when handling broken tiles to avoid cutting yourself on the sharp edges.